What Media Files are Accepted for WordPress Media Library Upload? WordPress allows quite many media files for uploading within the post or page, and this makes things easier for people to upload and add media to the blog without having to upload them somewhere else or through the cPanel of the blog. The direct upload option in wordpress though doesn’t allow uploading media files of all formats, and restricts that to a few certain file types. A few file types in images, documents, Audio and Video are allowed for uploading into the direct media library upload from within the WordPress post or page writing section. So the images have to be of these versions, and any other format of image won’t be accepted and the upload would be failed. You can either convert the other formats to one of the formats above, or else just link to the image which has to be uploaded somewhere else or directly in the cpanel of the blog. .pdf (Portable Document Format; Adobe Acrobat) – The PDF files can be uploaded, and is one of the documents files which is frequently used by bloggers to make the eBooks available for download through their blogs. .doc, .docx (Microsoft Word Document) – The Microsoft word document of the Office 2003 and later versions can be uploaded using the Media upload option. Most of the MS Office document file types are accepted in the WordPress media upload section, so you won’t need to have them uploaded at any download sites to share with the readers. The file types that are accepted in WordPress are same by default in both the WordPress self hosted version and the WordPress.com free version. 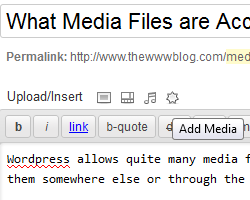 Uploading the Media to the WordPress posts or pages is quite easy, where above the content section you see the option of “Upload/Insert” and a few icons beside it. Based on the file you are uploading, select the option of image, video, audio or media where you need to select the last icon, i.e. Upload a Media File to upload the documents of various accepted file types.